Supermarkets have grown vastly in size and the range of goods carried over the last 50 years, so it is no surprise that some have started to sell petrol too. The European pioneers were in France in the mid-1960s, when the French Government imposed strict limits on the amount of refined petroleum products that could be imported. This kept prices high, and supermarkets realised that with their devolved corporate structures, they would be able to import fuel that the oil companies could not. Carrefour claims to have opened the continent's first filling station attached to a hypermarket in 1960. Initially growth was slow, focusing largely on Eastern France, nearer the main refining centres in Benelux and Germany, where firms such as Suma and Gro opened cheap filling stations in the parking lots of their largest stores. Over the next 30 years French hypermarkets captured almost half the retail market, forcing many thousand independent service stations into bankruptcy. Across in France the supermarkets continued to develop their networks, with much of the running being made by E. Leclerc and the loose association of companies using the Intermarché name. Other leading chains with petrol included Casino (which sold some sites to Shell & Agip), Continent/Champion, Rallye, STOC, ATAC, and Système U. The true hypermarkets with very large stores including Carrefour (which has owned Continent since 1999), Cora and Auchan (which owns ATAC) continue to sell own-brand fuel from increasingly sophisticated service stations. Hypermarkets sometimes advertise on town plans given away by tourist offices, such as this example from the small town of Cogolin in Provence. Leclerc had the rear cover of the map; but there were around 50 other small adverts in the margins of the map. 40,000 copies were printed by France Regie in 2006. E. Leclerc is a major operator of medium sized hypermarkets in France. Its first petrol stations were built at the end of the 1960s (and initially operated by a cousin of the main supermarket chain owner). Today there are over 470 service stations and the firm ranks (along with Carrefour and Intermarché in France and Tesco in Britain) as one of the top 20 brands of petrol in Europe. Leclerc continued their expansion into fuel retailing by buying some of TotalFinaElf's former motorway sites in early 2001. The first edition of the map shown above dates from 1976 and the one shown from 1984 - it is hard to tell which panel forms the front cover! This map locates all Leclerc stores and petrol stations (which can occasionally be remote from the stores) on a map at 1:1,100,000 produced by Gallardi. 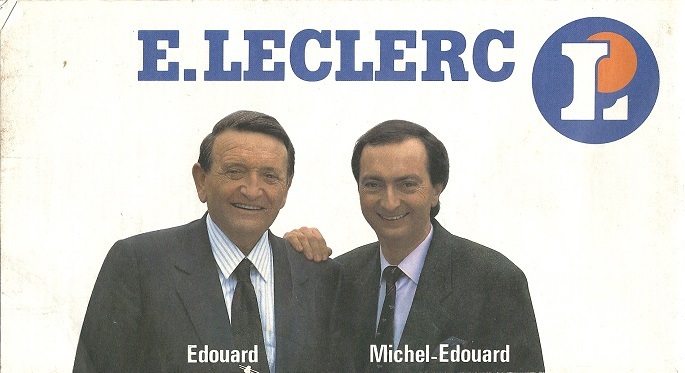 Leclerc's commitment to low prices was strong enough for the rear cover to feature the owners! Enlarge main cover, rear cover or map images. The first three images above are taken from a summer 1991 holiday map. Using Recta-Foldex cartography, except for the Paris metro inset, all main roads were washed out, with only "off-the-beaten-track itineraries" shown in brown. All Leclerc's stores were numbered and shown on the map and listed in numerical order. In addition 13 different types of tourist facility were marked; the enlarged extract shows 8 of them. The Leclerc map (right) is undated but probably from 1992. It again locates all stores by numbers and addresses, but unlike the summer 1991 map is a "normal" road map, without highlighting tourist sites. Recta-Foldex was responsible for the cartography. The text at the top translates roughly as "The easiest way to travel farther is always to pay less for petrol"; the other side showed a deck chair with a slightly different maxim at the top - neither cover made any mention of there being a proper road map at 1:1,000,000 inside. Intermarché started in 1969 when some 95 stores split from Leclerc. Organised in a relatively loose federal structure, Intermarché grew rapidly and absorbed numerous smaller chains, such as the Normandie Co-op. By the mid-1970s stores were beginning to add petrol sales, sometimes weakly branded in the name of an affiliate, STM Services. Before long though, the Intermarché name was brought to the fore and its distinctive hexagonal sign became familiar to motorists as the nation's leading vendor of cheap petrol. By 1999, when the second map shown here (far right) was issued, Intermarché had 1,650 stores across France, of which 1,392 sold petrol. The front cover was not printed; instead an 8-page booklet was pasted to it and - as can be seen in the picture - it was stuck on at a slight angle! Both maps were prepared by IGN at the scale of 1:1,200,000; the earlier one included small inset maps of other countries with Intermarché stores marked on them. An unusual feature on the later map is an inset showing the path of the 1999 total eclipse of the sun, with a warning in three languages to motorists "not to let this phenomenon take you by surprise". Intermarché's 2005 map is more conventional, being prepared for them by Bottin at a scale of 1:1,700,000. All the supermarkets are marked by a small hexagon (in red for Intermarché and in blue for the smaller Écomarché stores). The reverse side lists the addresses of all stores, and indicates which ones sell petrol identifying those open 24 hours. In all there were 1,344 petrol forecourts, of which 77 were attached to Écomarché stores. The map also carries 10 panels of advertising, mainly for food products. Intermarché also has some service stations under the Netto and Roady brands in France; it also has stores in 5 other European countries, including at least two with associated petrol stations (Belgium and Portugal), but no road maps are known from these smaller operations. Casino is one of the largest French retail groups, with its origin in a store opened in 1892 in a converted casino in Saint-Étienne, the city in which it is still based. As with other French chains, it has a somewhat complex history, but has incorporated Rallye (another operator of hypermarkets with petrol stations) and owns Leader Price, Franprix and Monoprix, as well as numerous Casino cafeterias and hundreds of smaller stores. At one time it stopped sales of own brand fuel, switching its stations to either Shell or AGIP, but this has now been reversed with all fuel locations under either the Casino or Géant names. No road maps are known from Casino's international operations, which are based mainly in Africa and South America. The left and centre images below are from a 1995 promotional map from the Géant hypermarkets for cold destinations to visit in summer. These includes lakes, rivers, estuaries, glaciers and mountains. 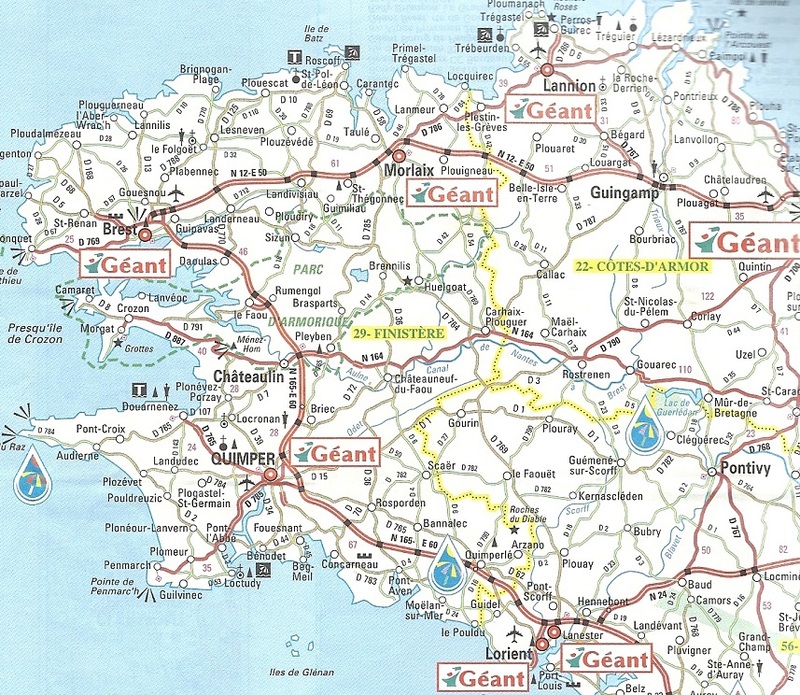 These were marked with raindrop-shaped symbols, and Géant's hypermarkets were also located, with a larger symbol used for towns with more than one (such as St-Brieuc on the enlarged map extract). The wine merchant Ricard was named as a co-sponsor of the map on the rear cover. 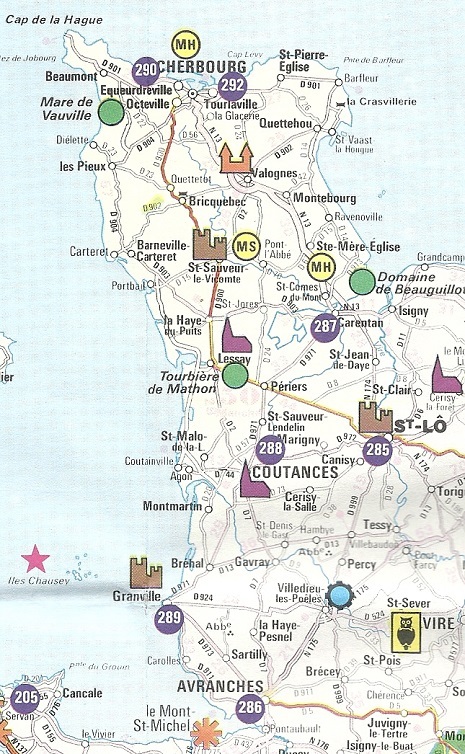 Enlarge In 2002 the Casino chain gave away this map (right) showing its Cafétérias in France. Gallardi first created the title in 1999, which by 2002 listed 219 restaurants, mainly at Casino or the larger Géant stores, most of which have attached filling stations. Euromarché were a relatively early operator of true hypermarkets. As such they were relatively few and far between with this 1976 Michelin map marking just a couple of dozen locations. A series of inset plans showed the exact location of each outlet - almost all sold petrol. Euromarché was absent from SE France as it worked in partnership with Provencia in that area. Fuel at some of the earliest hypermarkets was weakly branded "MASA", and by 1990 some Euromarché sites were selling major brands such as BP. In 1991 the chain was bought by Carrefour, the market leader in hypermarkets. Radar was formed in 1972 from the Familistère chain. With an even more complex history than most, Radar twice suffered financial difficulties; the first led to the loss of most of its hypermarkets to Cora, but then it later transferred many of its stores to Felix Potin. Ultimately many of the Radar stores ended up under either Promode's Champion or Comptoir Moderne's STOC banners; both would now be carrying one of Carrefour's formats. The map shown here must date from near its peak, as it mentions 2,300 shops. It was published in 1975 and is a high quality map of France from IGN at 1:000,000. Unlike many supermarket maps, it makes no attempt to mark where Radar stores could be found. Système U is the co-ordinating body for around 800 independent stores operated under the Hyper U, Super U and Marché U names. 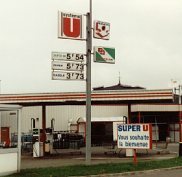 To prove that Système U was used as a petrol brand, I have included a 1995 photo of the filling station attached to the Super U at Mortagne au Perche; these days most simply display the letter U. 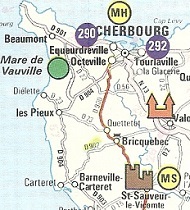 Around 1990, the store in La Trinité sur Mer (in Brittany) was the sole sponsor of the map shown left. No other advertising is carried, and the map states that it was offered by Supermarché Système U. However this is not a true petrol map, as the Système U was just a store on the main square with no fuel sales. Ironically, Système U no longer have a store at all in La Trinité sur Mer. In 2004 Système U published a map of France at the scale of 1:1,000,000 with cartography by Recta-Foldex (above right). This marked all their supermarkets on the map including small insets for DOM-TOM territories such as Réunion; an index of stores was also included that indicated which ones sold fuel (and highlighted those with LPG). 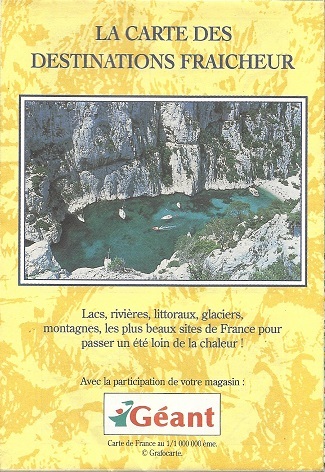 The cover fails to mention that it is a map (or of France) but merely carries the advertising slogan "(Les nouveaux commerçants Tout près de vous)". The company was one of the first to have an interactive map on its website, based on the excellent Michelin maps, enabling you to find the route to your nearest store and indicating whether it sells petrol, but this has now been replaced with a much less impressive Google map. The Cogolin map above, represents one end of the advertising map spectrum; a 1978 issue of the small town of L'Aiguillon sur Mer (85) represents the other, with a simple town plan being produced for free distribution, printed on one side of the paper only. This was crudely drawn and printed in two colours (blue and green) onto glossy paper by OGP (G Piriou of Nantes), surrounded by fourteen adverts for local businesses. Two supermarkets are represented, of which one, a Bravó promotes its service station. The Bravó was actually over 21km away on the North side of Luçon, but the store has since closed. Bravó was a name introduced in 1972 by three wholesalers known as Disco, and at its peak had 136 supermarkets, but most were too small to have associated petrol stations. After the sale of its parent, wholesalers using the Bravó name switched their stores to other fascias and the name had completely gone by around 1995. It is likely that several other supermarket chains have also sold or given away maps. In 2001, Champion supermarkets are known to have given away a map marking the route of the Tour de France, as well as their own supermarkets. No maps are known from other French supermarket petrol station chains including names such as Auchan, Carrefour, Cora, Rond Point (OK) and Continent. But, as always, if you have one, then please let me know!